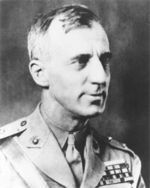 [Editor's Note: Smedley Butler is my idea of a true American patriot. Born into an upper class Quaker family from Pennsylvania, he dropped out of the elite Haverford School at age 16 in order to join the Marines with the outbreak of the Spanish American War against Spain (Cuba) in 1898. He lied about his age and was commissioned a second lieutenant. He was first wounded at Guantanamo; then fighting the Boxer Rebellion in China in 1900, in Hondurans in 1903 protecting the American consulate, at the Battle of Veracruz, Mexico in 1914 and in Haiti in 1915. His bravery under fire earned him the Congressional Medal of Honor twice, along with top medals from the Marine Corps and the government of France (First World War). His father, Thomas S. Butler, was a judge who became a US congressman for 31 years and was chairman of the House Naval Affairs Committee during the Harding and Coolidge administrations. Smedley's high ranking within the military and his father's high position within the government gave him the opportunity to see the Big Picture and the Money Boys behind the scenes. He learned in the first half of the twentieth century what I had only learned in the closing decade of that century. Simply stated : modern wars are maneuvered and engineered into existence in order to generate obscene profits for behind-the-scenes corporate manipulators whose sons and daughters never serve or die in those wars. Regardless of age, after having served in the military (and especially in a war zone), you feel a sense of connectedness and camaraderie with all who have served or are currently serving. It's frustrating to get derogatory mail from service personnel who are under the same delusions about the government and our "mission" that I had once assumed. Smedley Butler published this short book in order to SAVE the lives of young American military personnel, to SAVE the unnecessary tax yoke placed on the American citizen, and to preserve the sovereignty of this nation. He was a true patriot because he could recognize the truth from the mountain of lies that we are fed by the government and their stooges in the press. He wasn't about to sit back in silence while the manipulators were setting the stage for World War Two. In the [First] World War, a mere handful garnered the profits of the conflict. At least 21,000 new millionaires and billionaires were made in the United States during the World War. That many admitted their huge blood gains in their income tax returns. How many other war millionaires falsified their tax returns, no one knows. Out of war, nations acquire additional territory, if they are victorious. They just take it. This newly acquired territory promptly is exploited by the few – the selfsame few who wrung dollars out of blood in the war. The general public shoulders the bill. The assassination of King Alexander of Jugoslavia [Yugoslavia] complicated matters. Jugoslavia and Hungary, long bitter enemies, were almost at each other's throats. Italy was ready to jump in. But France was waiting. So was Czechoslovakia. All of them are looking ahead to war. Not the people – not those who fight and pay and die – only those who foment wars and remain safely at home to profit. Undoubtedly Mussolini means exactly what he says. His well-trained army, his great fleet of planes, and even his navy are ready for war – anxious for it, apparently. His recent stand at the side of Hungary in the latter's dispute with Jugoslavia showed that. And the hurried mobilization of his troops on the Austrian border after the assassination of Dollfuss showed it too. There are others in Europe too whose sabre rattling presages war, sooner or later. The normal profits of a business concern in the United States are six, eight, ten, and sometimes twelve percent. But war-time profits – ah! that is another matter – twenty, sixty, one hundred, three hundred, and even eighteen hundred per cent – the sky is the limit. All that traffic will bear. Uncle Sam has the money. Let's get it. Take our friends the du Ponts, the powder people – didn't one of them testify before a Senate committee recently that their powder won the war? Or saved the world for democracy? Or something? How did they do in the war? They were a patriotic corporation. Well, the average earnings of the du Ponts for the period 1910 to 1914 were $6,000,000 a year. It wasn't much, but the du Ponts managed to get along on it. Now let's look at their average yearly profit during the war years, 1914 to 1918. Fifty-eight million dollars a year profit we find! Nearly ten times that of normal times, and the profits of normal times were pretty good. An increase in profits of more than 950 per cent. International Nickel Company – and you can't have a war without nickel – showed an increase in profits from a mere average of $4,000,000 a year to $73,000,000 yearly. Not bad? An increase of more than 1,700 per cent. Even so, it has had some effect. The State Department has been studying "for some time" methods of keeping out of war. The War Department suddenly decides it has a wonderful plan to spring. The Administration names a committee – with the War and Navy Departments ably represented under the chairmanship of a Wall Street speculator – to limit profits in war time. To what extent isn't suggested. Hmmm. Possibly the profits of 300 and 600 and 1,600 per cent of those who turned blood into gold in the World War would be limited to some smaller figure. But don't forget – the soldier paid part of the dollars and cents bill too. Up to and including the Spanish-American War, we had a prize system, and soldiers and sailors fought for money. During the Civil War they were paid bonuses, in many instances, before they went into service. The government, or states, paid as high as $1,200 for an enlistment. In the Spanish-American War they gave prize money. When we captured any vessels, the soldiers all got their share – at least, they were supposed to. Then it was found that we could reduce the cost of wars by taking all the prize money and keeping it, but conscripting [drafting] the soldier anyway. Then soldiers couldn't bargain for their labor, Everyone else could bargain, but the soldier couldn't. "All men are enamored of decorations...they positively hunger for them." So vicious was this war propaganda that even God was brought into it. With few exceptions our clergymen joined in the clamor to kill, kill, kill. To kill the Germans. God is on our side...it is His will that the Germans be killed. And in Germany, the good pastors called upon the Germans to kill the allies...to please the same God. That was a part of the general propaganda, built up to make people war conscious and murder conscious. All they had to do for this munificent sum was to leave their dear ones behind, give up their jobs, lie in swampy trenches, eat canned willy (when they could get it) and kill and kill and kill...and be killed. We made them buy Liberty Bonds at $100 and then we bought them back – when they came back from the war and couldn't find work – at $84 and $86. And the soldiers bought about $2,000,000,000 worth of these bonds! A few profit – and the many pay. But there is a way to stop it. You can't end it by disarmament conferences. You can't eliminate it by peace parleys at Geneva. Well-meaning but impractical groups can't wipe it out by resolutions. It can be smashed effectively only by taking the profit out of war. "Had secrecy been outlawed as far as war negotiations were concerned, and had the press been invited to be present at that conference, or had radio been available to broadcast the proceedings, America never would have entered the World War. But this conference, like all war discussions, was shrouded in utmost secrecy. When our boys were sent off to war they were told it was a "war to make the world safe for democracy" and a "war to end all wars."